Martin Luther is the epic tale of the great Protestant revolutionary whose belief in his faith would overthrow the all powerful Catholic Church and reshape Medieval Europe. 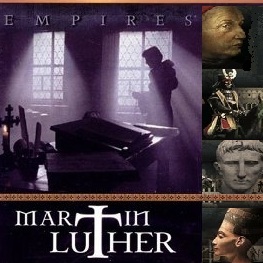 Join Luther as he recalls his life, from his initial crisis of faith in a storm wracked forest that led him to become a monk, to his heady confrontation with the great powers of Europe It is the story of the birth of the modern age, of the collapse of medieval feudalism, and the first shaping of ideals of freedom and liberty that lie at the heart of the 21st century. But this is also an intensely human tale, a story that hurtles from the depths of despair to the heights of triumph and back again. This is the story of a man who ultimately found himself a lightning conductor of history, crackling with forces he could not quite comprehend or control. Driven to Defiance – Few if any men have changed the course of history like Martin Luther. In less than ten years, this fevered German monk plunged a knife into the heart of an empire that had ruled for a thousand years, and set in motion a train of revolution, war and conflict that would reshape Western civilization, and lift it out of the Dark Ages.